The Singing Cowboy is a 1936 American Western film directed by Mack V. Wright and starring Gene Autry, Smiley Burnette, and Lois Wilde. Based on a story by Tom Gibson, the film is about a cowboy who decides to sing on television in order to raise money for the orphaned daughter of his former boss who was murdered. Ranch owner Steve Stevens (John Van Pelt) is shot by his greedy partner, Martin (Lon Chaney, Jr.), who then sets fire to Stevens' barn. 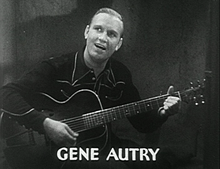 Stevens' last request is for cowboy Gene Autry (Gene Autry) to look after his daughter, Lou Ann (Ann Gillis), who was trampled by a horse during the barn fire and paralyzed. Martin befriends Lou Ann, hoping to gain possession of the secret gold mine beneath the Stevens' ranch. Lou Ann does not suspect Martin in her father's murder. Needing to raise $10,000 for Lou Ann's spinal surgery, Gene takes a job with Covered Wagon Coffee Company and travels in a caravan equipped with radio equipment, broadcasting a Covered Wagon Coffee show to small towns in the West. In his home town of Plainesville, Gene organizes an amateur singing contest. Helen Blake (Lois Wilde), the daughter of his boss Henry Blake (Harvey Clark), auditions without her father's permission. Concerned about his daughter, Henry Blake sends Helen's fiancée, Herbert Trenton (Earl Eby), after her. With the date of Lou Ann's surgery quickly approaching, Gene receives a bank advance on his radio contract. Martin steals Gene's wagon, unaware that Helen is hiding inside. She secretly sends an "S.O.S." signal using the radio equipment, and Gene is able to find the wagon and save her. Martin's gang follows Gene and Helen into town where they are arrested. Gene collects the reward money offered by Trenton for Helen's safe return, getting enough money to cover Lou Ann's surgery. Thinking that Gene is only interested in her money, Helen goes back to Trenton. Gene eventually captures Martin, and after his men reveal his guilt in connection with the secret gold mine, he is also arrested. After performing in the recovered coffee caravan, Gene rushes to the Plainesville courthouse and saves Helen from marrying Trenton. Gene and Helen sing "Rainbow Trail" while a recovering Lou Ann looks on. ^ "The Singing Cowboy". Internet Movie Database. Retrieved June 1, 2012. ^ "Full cast and crew for The Singing Cowboy". Internet Movie Database. Retrieved June 1, 2012. ^ "Locations for The Singing Cowboy". Internet Movie Database. Retrieved May 31, 2012. ^ "Soundtracks for The Singing Cowboy". Internet Movie Database. Retrieved June 1, 2012.